Take your parking skills to new heights with our guide to conquering your local multi-storey car park. We'll help you take on the multi-storey car park. There are some situations that your driving lessons don’t prepare you for. One of the most common – and the most feared – is negotiating a multi-storey car park. This fear isn’t entirely misplaced; there are barriers to contend with, manic shoppers rushing around, impatient vehicles everywhere and tiny spaces to squeeze between. Usually, multi-storey car parks are controlled by a simple, automated barrier system. You just drive up to the ticket barrier, wind down your driver’s side window and press the button on the machine, which issues a ticket. These barrier entrances can be narrow, so take your time as you drive in, watching out for where the kerbstone lies, and for any bumps and bollards. To make life easier, steer slowly and carefully as you slow to collect your ticket so you’re as close to the machine as possible without scraping your alloys on the kerb or clipping your wing mirror. It’s worth getting your approach right to avoid having to lean halfway out of your door window – or worse, getting out of the car entirely – to grab a ticket. You’re in! Now you’ve successfully nabbed your ticket, it’s time to run the concrete car park gauntlet (deep breaths: it’s really not that bad). If it’s busy, the best thing to do is head directly for a higher level; don’t drive around hoping for a space to become available. As you do, watch out for floor markings and signs. Usually, there’s limited space in a multi storey, so you’ll need to make sure you don’t turn into a one-way area, or accidentally enter an exit route. When you’re driving up through the levels, there may be narrow concrete ramps to negotiate. The best way to tackle these is to treat them as you would a parking space, giving yourself as wide a turning angle as possible, and adjusting your approach as necessary. If you’re on a ramp and find the angle’s too tight, check your wing mirror carefully before attempting to reverse; if there’s someone behind you, they won’t appreciate you suddenly backing up! Eventually, you’ll find a space. And that space will probably be narrow, especially if you’re in an inner-city car park. Don’t be daunted by this. To make it easier to get out, it’s worth reversing in. Take it slow and don’t forget to indicate that you’re about to park to any drivers around you. As you slowly reverse into the space, be aware of any concrete pillars, and check mirrors periodically for pedestrians. Make sure you don’t back up too enthusiastically and slam into a wall or high kerb. If you have a reversing camera, you’ll be just fine. And if you really can’t handle a reverse park, on your forward approach make sure you’re as far as possible from the space to give yourself a decent turning angle. Don’t be afraid to take a little time to shimmy your car into an equidistant position so you can get out without scratching the doors. Parking sensors are your friend if you’ve got them. Check any signs for information about when and how to pay. In many car parks, you’ll need to keep your ticket and reinsert it into the payment machine before you leave, so keep it in a safe spot in your wallet or phone case. And don’t forget to take a note of where you’re parked, it’s so easy to head straight for the lift when you’ve parked up, then forget what floor you were on when you return. We’ve all done it. If you’re unfamiliar with a multi-storey car park, don’t go at a busy time for your first attempt. Choose to visit when you know that the car park will be quiet, like first thing on a Sunday, or late on a Wednesday evening, and ease yourself in gradually. 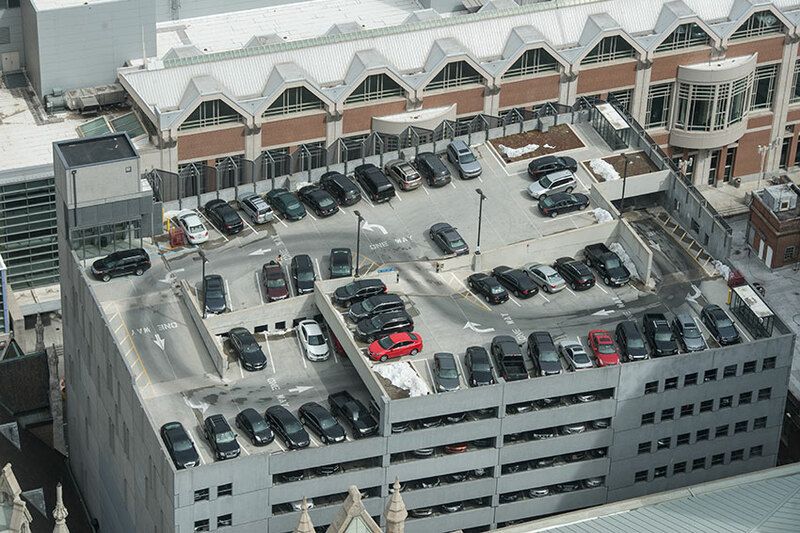 If you’re daunted by the prospect of parking in such narrow confines, head straight for the farthest-flung spot in the car park – even if it means driving up eight floors – and find two adjacent places. This should ease some of the stress until you’re comfortable with a single-car space. The longer you put off doing something that scares you, the harder it becomes to conquer your fear. Remember: the sooner you take on the multi-storey challenge, the more confident you’ll become as a driver. Still in need of some parking assistance? Check out our guide to parallel parking like a pro.